How to make gazpacho with tomatoes, cucumber, jalapeño, garlic and sherry vinegar. 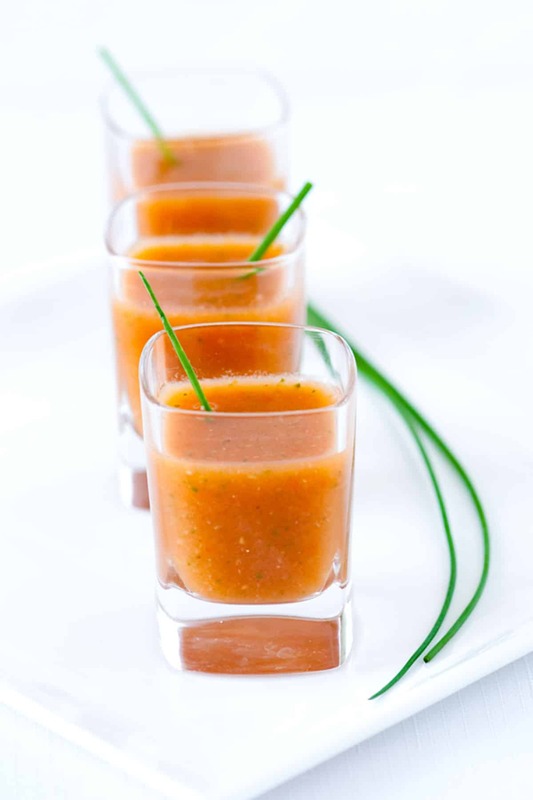 Jump to the Roasted Tomato Gazpacho Recipe or read on to see our tips for making it. Gazpacho is fresh and delicious. 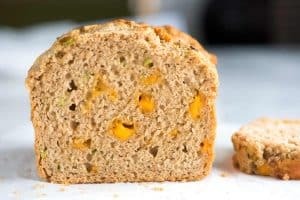 It also keeps well and gets better as it sits in the refrigerator — this is perfect for making ahead of time! 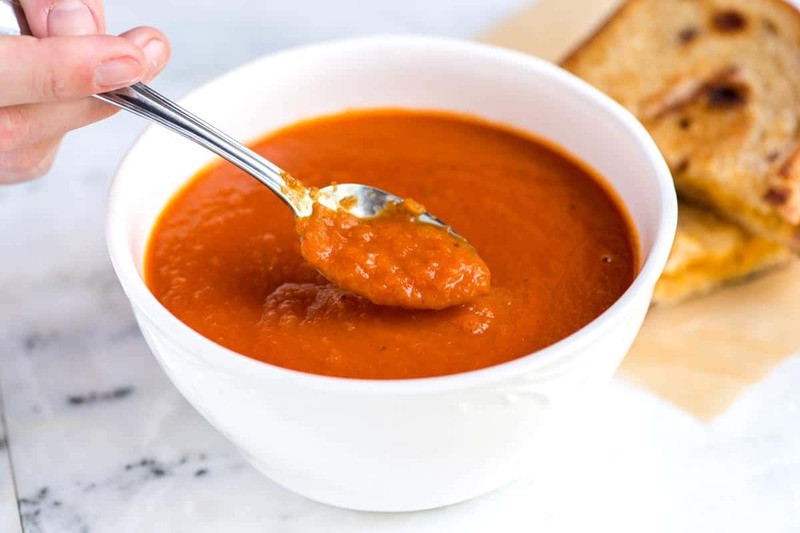 Gazpacho is a chilled tomato-based soup and generally is left uncooked. 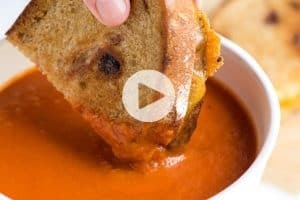 It’s important to use the best ingredients, especially when it comes to the tomatoes. Since we don’t always have access to the best tomatoes, we turn to roasting. By roasting about half of the tomatoes, the sugars and flavor of the tomatoes intensify. Roasting is up to you — if you have amazing tomatoes, don’t roast and just use them raw. Even more flavor comes from fresh basil, onion, lemon, cucumber and a little sherry vinegar. The soup really pops and is perfect served cold in warm weather. It’s also delicious served warm in cool weather. YOU MAY ALSO LIKE: This chilled pea soup made with spring peas, mint, garlic and shallots then topped with shrimp and mint. 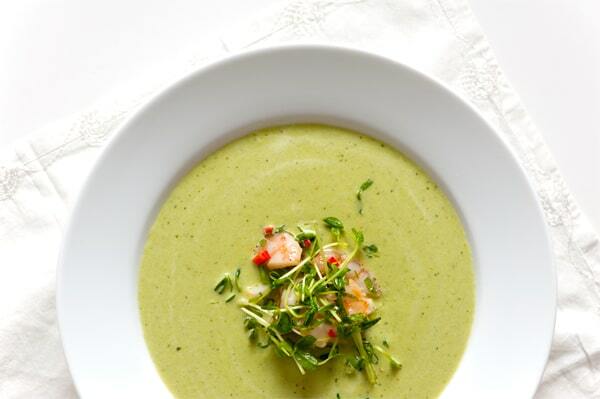 Jump to the Chilled Pea Soup Recipe with Shrimp. Traditional gazpacho uses all raw ingredients. This recipe takes advantage of roasted tomatoes in order to add an extra touch of sweetness. 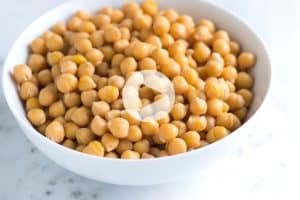 If you prefer, skip the roasting and use all ingredients in their raw form. If you do this, we suggest reducing the amount of garlic and possibly the amount of jalapeño since roasting would have toned them down a little. Arrange half the tomatoes, jalapeño and unpeeled garlic cloves in a pan with sides, cut sides up, in a single layer. 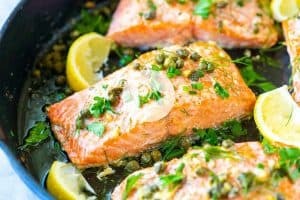 Drizzle with 1 tablespoon of olive oil and sprinkle with a pinch of salt. Roast for 20 minutes. Remove from the oven. Place the jalapeño into a bowl covered in plastic wrap or in a re-sealable plastic bag for 10 minutes, peel, remove seeds and roughly chop. Add the roughly chopped jalapeño, roasted tomatoes and any juice from the baking sheet to a large mixing bowl. Squeeze the garlic out of the garlic peel and add to the roasted tomatoes. Add the uncooked tomatoes, cucumber, red onion, tomato juice, basil leaves, olive oil, lemon juice, sherry vinegar, salt and pepper and stir to combine. Transfer 1 1/2 cups of the mixture to a blender or food processor and puree for 15 to 20 seconds on high speed then add to a separate large bowl. Repeat until all ingredients are pureed. Cover and chill for at least 2 hours. Make Ahead: Gazpacho gets better over time. Make this up to 3 days in advance. This recipe was originally shared with maché magazine and we are happy to be able to share it with you! It is just in this past year that I have come to enjoy chilled soups. I have yet to make Gazpacho but this looks so good. Thanks for sharing your gorgeous photos and recipe. 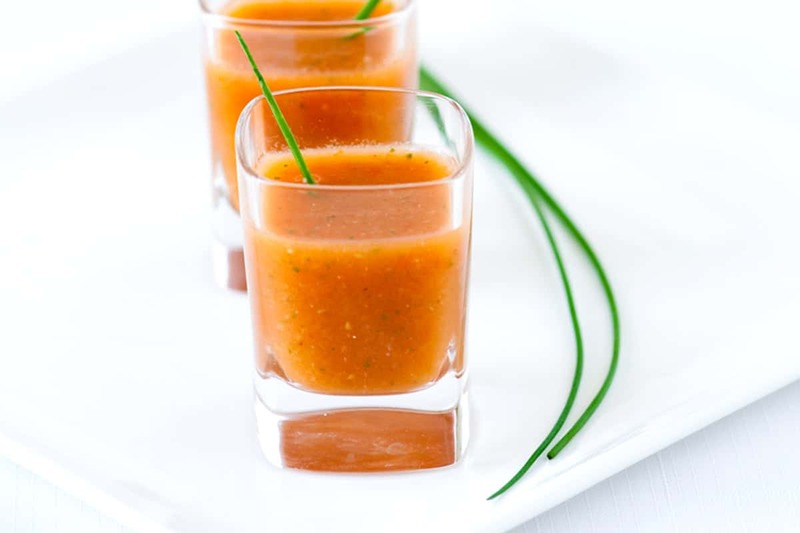 Nice recipe and gorgeous pic – I really like gazpacho and this is a reminder to make it more often.